You've come to the right place. Growing rhubarb is easy to do. Much like asparagus, rhubarb is not harvested until at least the year after it is planted. The plant will continue to get larger every year. If you like to eat rhubarb, waiting a year or two between planting and harvesting is definitely worth the wait. It's hard to beat the taste of fresh strawberry-rhubarb pie. Rhubarb is a perennial plant, meaning it will come back year after year on it's own. Once you have an established plant or two, very little maintenance is required. Most rhubarb plants have a 7-10 year life expectancy, although some plants will last much longer, sometimes even decades. We've even heard of some rhubarb plants existing on farms or homesteads for generations. Rhubarb is usually grown in a traditional vegetable garden. Because of the large size of mature plants, it is generally not suitable for container gardening. 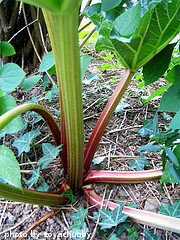 A large, mature rhubarb plant can reach 4-5 feet across, with leaves the size of dinner plates. 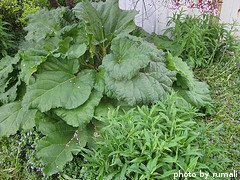 Because of their size and longevity, careful consideration should be taken in choosing a suitable location for your rhubarb plants(s). Depending on how much you like rhubarb, typically 1-2 plants will produce enough rhubarb for a family of 4. If you want to make lots of rhubarb jam or freeze a dozen rhubarb pies, you may want to grow a few more plants. Rhubarb plants love cold weather. They thrive in areas where the ground freezes in the winter time. This forces the plants into dormancy, which causes them to come back bigger and better the following spring. The plants generally do not grow well in warm climates. They require well drained, fertile soil and mostly full sun to reach their full potential.